This cheating exposed chavismo for what it is: a fraud. Thanks Daniel, do you have the same table for Zulia? I have not included Zulia because that states behaves "normally" that it woudl behave in the US or Canada. That is, whoever wins gets more seats than whomever loses, and gets a bonus for winning. In the three cases I chose, EVERY TIME chavismo gets less votes and every time it gets equal or more seats than the other side. I have no problem with the winner taking more seats, I have no problem, even for on occasion a slight loser taking a slight advantage in seats, but this table is simply ridiculous, undemocratic and what not. Have you read our "friend" Weisbrot? 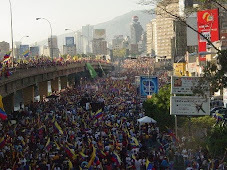 http://www.guardian.co.uk/commentisfree/cifamerica/2010/sep/27/venezuela-election-opposition-politics Laughable how they try to explain the unexplainable! Thanks Daniel, fully agree. Already, the Spanish papers are picking on this. Thought this might provide a laugh! In your attempt at exculpating Chavez you only display your ignorance of electoral systems and their historical reasons for their existence. Amen of not understanding how they actually work. ...this sort of result happens anywhere that there are multiparty elections for representatives from districts. This is not true in situations of extreme polarization like in Venezuela. A multiaprty election is when at least three aprties ahve a chance of getting at least 10% each. Look at the British elections just past (when you go nationwide, or by regions, you get numbers like those posted), or the Canadian one (being Canadian, I can tell you the results looked even more out of whack). In the US in addition there are strict rules about circuit design and it is today nearly impossible to observe the extreme gerrymandering that has taken place in Venezuela this year. Can't you have at least the intellectual honesty of acknowledging that fact which has been amply reported and discussed in this blog for over a year now? And then, of course, there's the American 2000 Presidential race. Very wrong choice of example. The US is a federal system and thus the historical intent of the constitution was that the president was elected by a majority of the states, not of votes. And it did happen in the past, before 2000. Besides we are discussing legislative elections, not presidential which is some countries are not even popular elections and yet these countries are not accused of being undemocratic. But if you want to see horrifically skewed results betweeen what the popular vote was, and the seats won, look at the Lebanese election, where Hezbollah won the majority vote (they even won the majority Christian vote) and yet took fewer seats than their rivals. Another totally irrelevant example. Multi confessional or multi ethnic states need to preserve the rights of the minorities and often have electoral clauses that will imply an underrepresented of the majority. So you are aware of that fact, good. Then you should also be aware of that fact: with 1% advantage chavismo gets 50% more seats. Since you are so knowledgeable find me such an example elsewhere. Next time, besides putting at least a number in your anonymous flavor, know who you are facing on electoral matters. So will you post Zulia and Anzoategui? Zulia is a very populous state and it'd be very important to see how fair the system was there. Thank you! "this sort of result happens anywhere that there are multiparty elections for representatives from districts"
Please, if this "happens anywhere," find one example for us all of another situation like Carabobo, where one party got a MAJORITY of votes and a MINORITY of seats, while someone else got a MAJORITY of seats. Just one example. Take your time.